From time to time, I invite persons who have experience with PNES and who have useful information to share with others, to post on this blog. Author of the wonderful book “View From the Floor: Non-epileptic seizures: A patient’s perspective”, Kate Berger, is sharing her knowledge and essential tips on how to navigate the school system when you are living with PNES. I invite to read on…. There is no doubt about it: the years I managed PNES alongside my education were harder than the years I only had to worry about homework. Kindergarten through junior year of high school paled in comparison to senior year and the subsequent four years of college – and not just because of the marked decrease in the number of coloring pages. I attribute much of my academic success in those years to the aid of specialty school services. When senior year became my seizure year, accommodations helped me successfully graduate high school. When it was clear that seizures weren’t just a high school thing, and would indeed be a part of college too, a new world of university supports helped me jump through the hoops and successfully graduate college as well. Being a student with seizures is difficult; but it isn’t impossible. In my previous post, I talked about rights and defined some new terms for you; in this post, I’m giving some practical tips that helped me survive school. Schedule a meeting with your teacher, or the disability service department as soon as school begins, or before, if possible. – These resources exist for the unexpected – the class you had to leave early, the unanticipated breakdown that led to missing a week of school. If you alert your teachers to the existence of a disability and have a plan of action in place from day one, the obstacle that appears on day 127 is a lot easier to handle. Trust me, you do not want to be simultaneously juggling an onslaught of seizures and trying to save your academic career. Hope for the best, but plan for the worst. It’s time for your proactive meeting, what should you do? Be prepared – over-prepared, if possible. Use your anxious mind to the best of its ability. Think of all possible questions and quandaries that may pop up, and be prepared with a response. If you come up against a stubborn teacher, draw from the confidence that comes from knowing your rights. A statement from a doctor or counselor diagnosing you with PNES or, Lord help us all, “pseudoseizures.” You can explain that the old term is outdated, but this note is a safeguard against the, “you’re faking” argument. – This note should not, under any circumstances, have information regarding how and why you developed PNES. Assume that no one will have heard of PNES and that they will have a lot of questions. Consider bringing a copy of “Psychogenic Non-Epileptic Seizures: A Guide” by Dr. Lorna Myers, and printing off some of the “FAQ” pages from nonepilepticseizures.org. Concern for both your safety and their liability are likely to be paramount. Before you can even get to the accommodation stage, you may need to reassure concerned parties that you are not a detriment to your own safety. Ensure that the safety plan is agreeable to you by bringing a host of ideas to the table. – Ex. “Call my mom/dad/spouse/roommate at “x” number if you have any concerns. Once you have assured that safety is taken care of, continue to be proactive by suggesting accommodations you feel would be most beneficial for you. – Use obstacles you have encountered in the past as a point of reference for what aids might be useful in the future. *Notice the phrasing of this statement. In such a meeting, you are the PNES expert in the room. There is no “I think,” or “if you don’t mind…” You confidently stated the problem as a fact – high anxiety makes it difficult to focus. You presented an accommodation solution – a note taker – and explained how you will utilize the accommodation appropriately – by comparing your own notes with those of the note taker. This phrasing highlights your strengths and the effort you will put forth in the course. Most likely, you will not get everything you ask for. It’s possible, but I wouldn’t count on it. Disability service officials and school counselors can help you, but most teachers have some say in how their class operates. – Come in with a lot of options and be willing to brainstorm alternative ideas. – Ex. Instead of a note taker, having the ability to audio record lectures. Outside of accommodations and safety plans, there are numerous things you can do to give yourself a leg up, especially once you reach the flexibility of college. Think realistically about college and your particular needs and craft strategies that give you the greatest chance for success. DO: Take online classes that transfer to your university for credit. Missing class is never an issue and you work at your own pace. DON’T: Stress yourself out by taking too many classes. If you’re nervous, start part-time, or take the minimum, full-time course load. – Tip: If you’re trying to get to full time hours and don’t want to add more academic classes, many universities offer fitness classes for credit. DO: Work the system to your advantage. If you don’t tend to do well on tests, make sure you nail the homework assignments each week. High homework, paper and project scores can help keep your GPA up in the wake of a poor test score. DON’T: Procrastinate. By all means, study however you like; I just happen to be an advocate for working ahead. If I had three weeks to write a paper, I’d find a good time for it somewhere in that first week of the assignment. PNES is a fickle, fickle beast and early on, I learned not to count on myself too much at the last minute. I didn’t have the luxury of knowing whether I would have the brain space to write a paper the night before it was due, or be having consecutive seizures that night, so I always planned ahead. DO: Cultivate a professional relationship with your professors. Be respectful. Professors are a lot more apt to help you if they don’t recognize you as the one who brings People magazine to class. I’m not saying you have to be a model citizen; I talked/texted/browsed the internet/ate snacks and drank beverages in probably every single room I ever entered in college. But, if you can avoid being the person in the second row eating Cheetos and listening to music during an 8am lecture, a request for special treatment is going to go over a whole lot smoother. Know that I gathered all of this knowledge through experience. It was trial and a whole lot of error. This isn’t a recipe for absolute success. There will be teachers who will not budge on accommodations. There will be bad days and maybe even a few dropped classes. But, it is my hope that you’ll learn from my experience, and that these tips will help you stumble through school just a little more smoothly. What if my teacher won’t grant me a specific accommodation that I have requested? 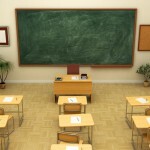 Teachers possess a certain amount of autonomy regarding their classrooms. While they are legally required to provide certain accommodations, they also have the right to veto certain requests. You, in turn, have the right to drop that class and switch to a different professor, alternate course etc. If switching is not an option, politely explain your concern regarding the absence of that accommodation. Keep the lines of communication open and agree to be in touch if the absence of that provision begins to hinder your academic performance; you may find there is a chance for further negotiation down the line. 2. What if my teacher insists on calling the paramedics if I ever have a seizure? Make your peace with it. Now, hear me out. I am fully aware of the hazards created by calling the paramedics unnecessarily; but I am also sympathetic to the situation of the teacher. Why do they need to call for an EMT? Because they’re scared. By insisting on calling for emergency assistance, that individual is telling you, “I don’t understand this condition and I’m not confident I can adequately handle this situation on my own. I’m afraid something bad might happen and I need help knowing how to handle this new challenge. The ability to call an EMT makes me feel safe.” You can confidently reassure them that this is unnecessary; that an EMT can do nothing for you during a seizure. You can walk them through what will happen if they call 9-1-1 and request that they not take this action, but ultimately, you cannot revoke their right to ask for help. I am well acquainted with the desire to create a safe setting for myself; and if you have ever preemptively sought out a safe spot to seize in a new environment, so are you. That is why I will state a preference, but refuse to deny someone the right to call 9-1-1. I have far too much respect for the need of another individual to create an equivalent sense of safety within their environment. this very thing with my daughter right now. This information will help me so much. Hi. I’m a principal and I have a 13-year-old boy who suffers from NES to take care of. He can’t get to a safe place and lies down in the corridors. Is there any way we can help him get to my office? What should we be saying to the other children? His episodes normally last for 45 mins. We then return him to class. Is there anything I can do to support him in spotting when an episode will happen. I am afraid that he could become incontinent in public in the corridors as this is something that happens during his episodes at times.